The tailored front allows the cover to be used with either 3 or 4 - wheeled scooters, and the clear front improves your safety by allowing your lights and indicators to be seen whilst being protected. The back panel goes over the back of the scooter protecting anything in your Back Sak. 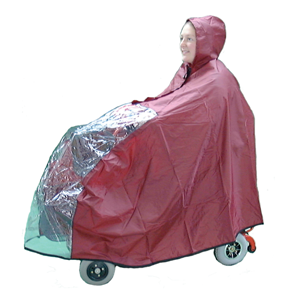 The tailored front allows the cover to be used with either 3 or 4 - wheeled scooters, and the clear front improves your safety by allowing your lights and indicators to be seen whilst being protected. The back panel goes over the back of the scooter protecting anything in your Back Sak. The Mini Skoota Kape has all the above features and is designed to fit the new generation of mini-scooters. It is available in one size in a choice of Royal Blue, Grey or Maroon.